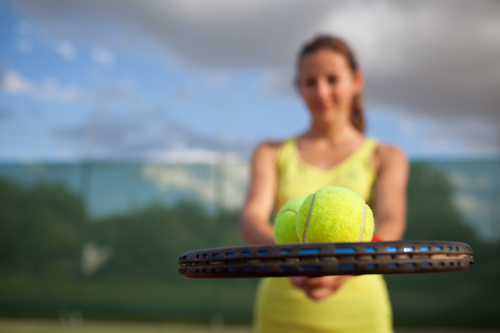 From serving to volleying, playing a proper game of tennis requires a variety of skills. But by keeping up with tennis lessons and regular practice, beginners can quickly develop a natural feel for the sport. To help novice players improve their skills, Beavercreek Clay Courts Tennis Club of Beavercreek, OH, highlights a activities for all tennis players. Any activity that involves tossing and catching an object is good for developing hand-eye coordination...including basketball, football, baseball, frisbee, and tennis. One of the best ways to develop hand-eye coordination with your racket is to bounce and dribble the ball. Gently hitting the ball upwards—or against the ground—will help you learn to control the force of your racket and maintain contact. If engaging in conditioning exercises, try to include those that involve exercises on one foot such as single-leg balancing, single-leg squats, squats on a foam pad, and hops for stabilization. Footwork is key for all tennis players. Good footwork allows a player to place their body in the optimum location for a stroke, cover more of the tennis court and lessen the potential of injuries. Footwork drills for tennis are similar to many other sports and include drills for strengthening, speed and agility...i.e. sprints, quick steps, moving to different locations on the court, jumping and turning. Since the game of tennis emphasizes hand-eye coordination, spatial awareness and agility, stretching should be a part of any tennis player’s routine. Stretching is one of the most under-utilized techniques for improving athletic performance and preventing sports injury. Focus on legs (calf, hamstrings), arms/wrist, back and shoulders. Have you ever watched a match between good tennis players then went out to emulate their strokes. You may not have matched their strokes and footwork; however, you have planted the seed of how to move and hit within your mind. Watching good players help feed the mind with the motions and strategy that will help all players improve in reaching the next level. Additionally, having your teaching professional video your match or lesson will help you change what you see yourself doing to what you want to see yourself doing. Whatever your skill level, finding the right place to practice is essential to staying in the game. If you live in Dayton, OH, check the Beavercreek Clay Courts Tennis Club. Opening May 5, 2018, these clay tennis courts will provide ample space to practice and get great exercise. Visit them online or Facebook to learn more about the facility, as well as tennis lessons and league services the club will provide. Call (937) 956-8864 today to ask about memberships for their clay tennis courts and hard surface pickleball courts.